Industrial meat cutters are in high-demand in Canada. That's what the POEA revealed when I looked for approved job orders for Canada as of today Feb 11, 2011 Manila time. 112 Industrial meat cutters are approved for Canada under the agency, INTERNATIONAL STAFFING ORGANIZATION INC. The job orders were approved last February 2, 2011. Industrial meat cutters prepare meat and poultry for further processing, for packaging or for marketing. They are employed in meat and poultry slaughtering, processing and packing establishments. The job is related to industrial butchers, poultry preparers. 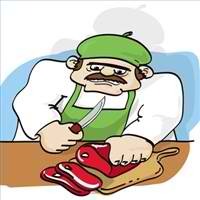 Meat Cutter image from ehow. * Job details taken from International Staffing Organization Inc.'s website. Here are contact details of the agency looking for 112 industrial meat cutters. The job order was taken from the POEA website today. Please verify with the agency if the job order is still active or not. Beware of illegal recruiters. Read about illegal recruitment here. Report to the POEA anything that may involve illegal recruitment immediately. Here's a good video of working industrial meat cutters & butchers. Checkout the POEA website regularly for approved jobs in Canada.